Visit the SouthernMamas.com Fall Fun Guide 2018 here to find pumpkin patches, fall festivals, Halloween fun & more. Check out the pumpkin patches below. This upcoming weekend is your last chance to make it to Poppell Farms pumpkin patch & corn maze near Jesup, Ga. this season. 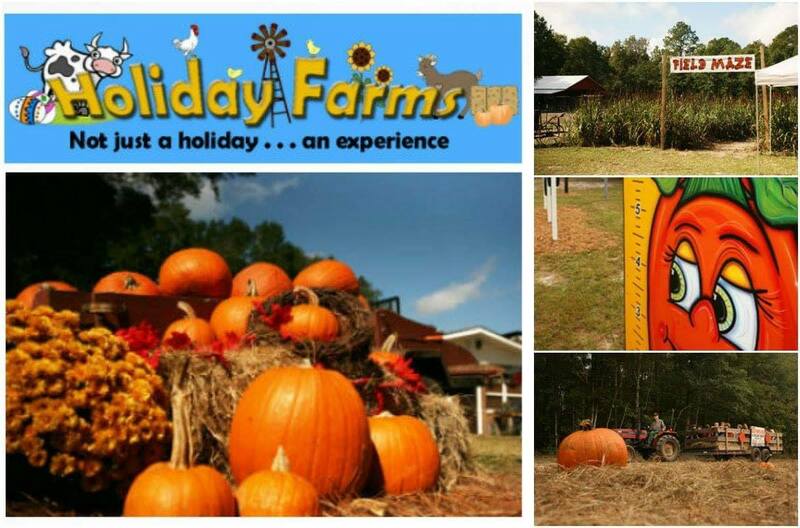 Holiday Farms pumpkin patch & hayrides in Ridgeland SC will be open through Oct. 31. Poppell Farms pumpkin patch, corn maze, hayrides, barnyard, cow train. Open every weekend in October through this Sun. Oct. 28. Details here. Holiday Farms pumpkin patch, hayrides, pig races, farm activities. Holiday Farms is open from Oct. 4-31 2018. Details here. 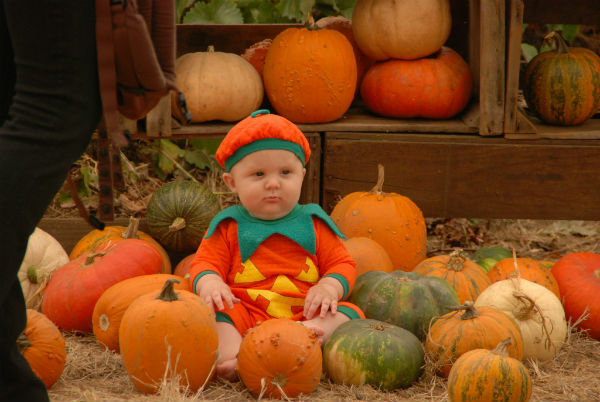 Pooler Pumpkin Patch & kids activities, Oct. 13-31 @ Risen Savior Lutheran Church with a Family Fall Festival Oct. 27-28. Open to the public. Details here. Come to the Historic Roberds Dairy for Scary in the Dairy 2018 Halloween Festival this Sun Oct. 28 2018 @ the old Roberds Dairy at the end of Tennessee Avenue, Thunderbolt. Enjoy haunted hay rides,horse rides, bouncy house, games, music and food for the whole family. Join the amazing PUMPKIN CARVING CONTEST @ 6PM and win horse back riding lessons or Monster Medalions. Proceeds will benefits the Pegasus Riding Academy new Veterans Program. Prizes for Best Pumpkins. Elementary, junior-high & high school divisions. Gift certificates for adult winners. 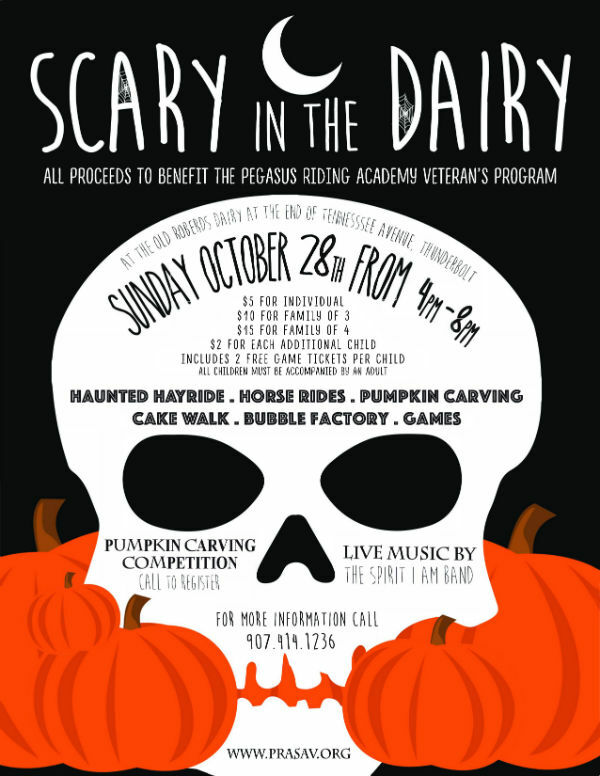 Winning pumpkins will be auctioned off to benefit Pegasus Riding Academy’s new veteran’s program. 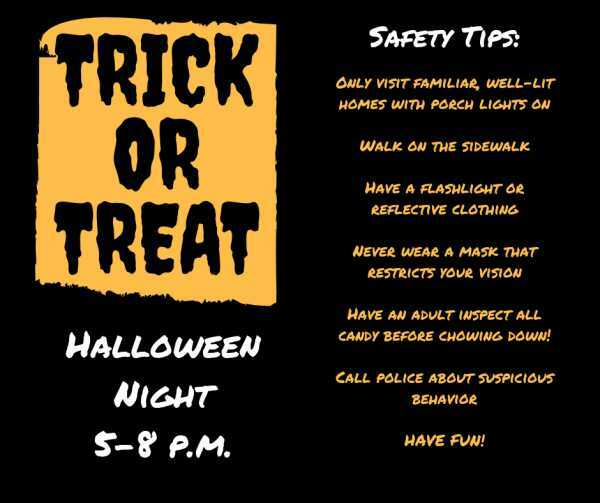 Find Savannah police Halloween safety tips here. Come out and enjoy pumpkin painting, a magic show, games, music, bounce houses, McGruff and CANDY! Tours will depart from the Visitors Center every 15 minutes beginning at 7:15PM. Wormsloe’s gate will open at 6:30PM. Last tour tickets will be sold at 9PM. Tours will continue until 10:00 pm as needed. Tour lasts approximately 45 minutes. The gate will close when all tours are sold out. 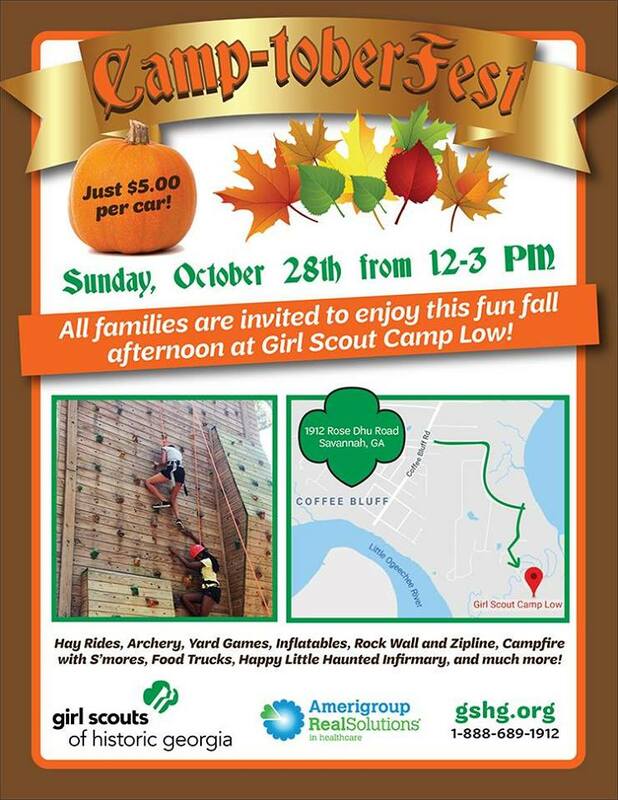 Girl Scouts of Historic Georgia (GSHG) invites all families (Girl Scout & non-Girl Scout) for Camp-toberFest 2018 on Sun. 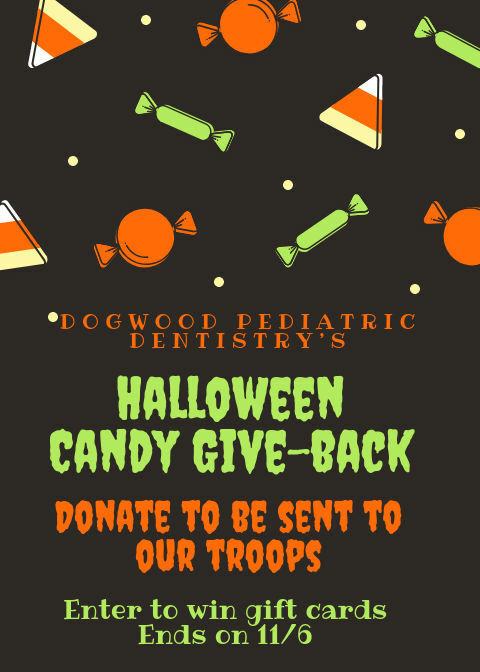 Oct. 28, noon-3PM @ Camp Low located at 1912 Rose Dhu Road in Savannah. The afternoon of fall fun will include hay rides, archery, yard games, inflatables, rock wall, zip line, campfire with s’mores, a “Happy Little Haunted Infirmary” & more. BowTie Barbecue Co. will be on site selling lunch items. Special thanks to sponsor Amerigroup for making this event possible. Cost: $5 per car at the gate. Cash is preferred, but cards will be accepted. 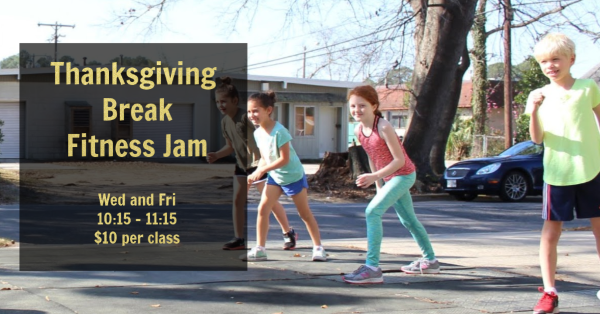 For more information, please contact Kayce Bradbury at kbradbury@gshg.org or 912-330-4440. 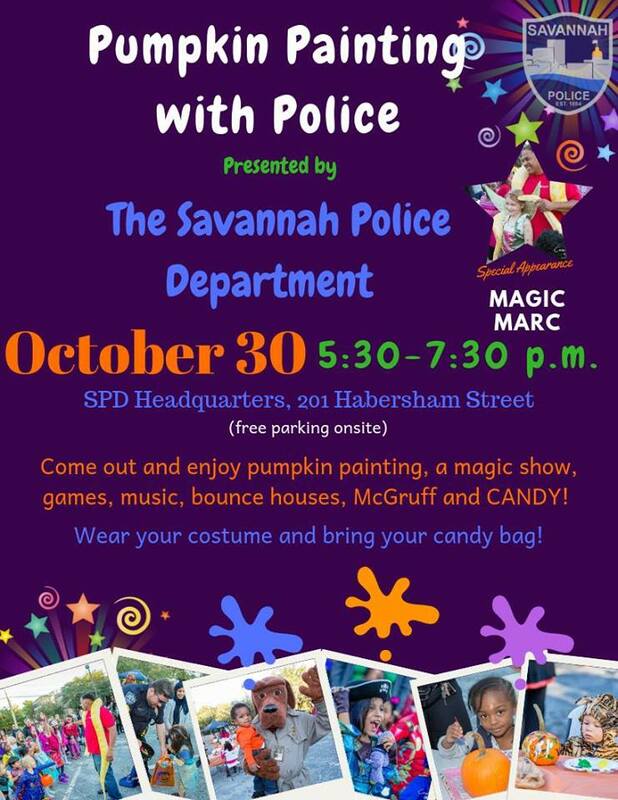 You’re invited for a safe and fun trick-or-treat experience for health- and eco-conscious Savannah-area families. Come Sat. Oct 27 2018, 2:30-4:30PM at Forsyth Park in Savannah. At 3:30PM, the group will begin the costume parade around the circle and allow the kids to pick up their treats. Feel free to stay after to play if you wish. What should you bring & more FAQ answers here. 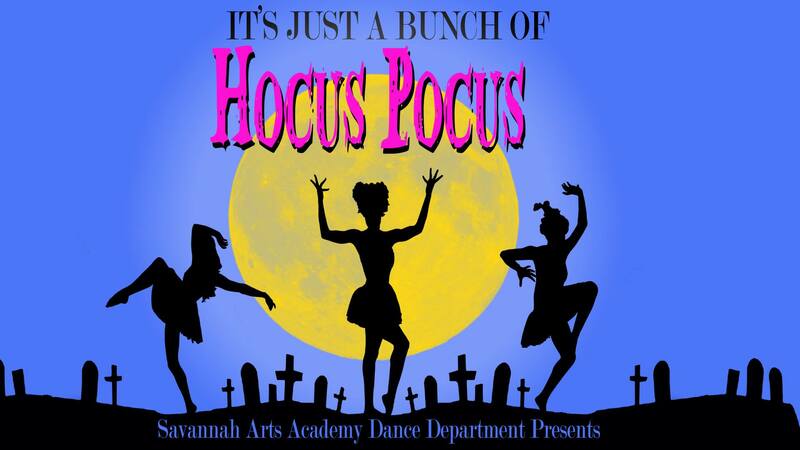 This live production of HOCUS POCUS Oct. 26-Oct. 28 2018 @ Savannah Arts Academy is filled with your favorite Halloween characters and tunes. Come for a kid-friendly spook-tacular time. Come for an afternoon of food and fun for you and your furry friends. Local food trucks will offer delicious food & even some snacks for your pups. Also enjoy pet boutiques, music, arts, crafts, vendors, pet rescue groups & more. Then you can take your pup for a walk on one of the many beautiful trails throughout the park. 912-598-2300. $5 parking. Annual passes available here. Ever wanted to see Wormsloe at night? 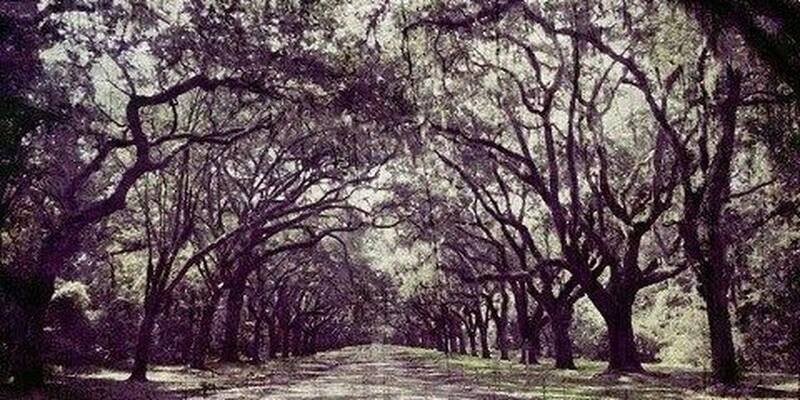 This is your chance to see Wormsloe in a whole new light. Guided tours will depart at 6PM & 7PM by lantern & will take you through time on a whirlwind tour with a variety of scenes that celebrate Savannah’s colonial heritage, from the city’s founding in 1733 up through the American Revolution. $4.50-$10. 912-353-3023. Learn the basics of shooting a compound bow with park rangers. You will be shooting in a safe environment. Fun for kids and adults, come see how you fair. You will be shooting at large target blocks on a secure range. Reservation’s required. $10 plus $5 parking. 912-727-2339. Learn more here. 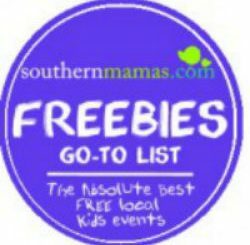 FOR MORE FALL FESTIVALS 2018, VISIT THE SOUTHERNMAMAS.COM FALL FUN GUIDE. Enjoy a day celebrating Impressionist and Post-Impressionist art @ FREE Family Day @ Telfair Museums’ Jepson Center in Savannah. Theme: Monet to Matisse. 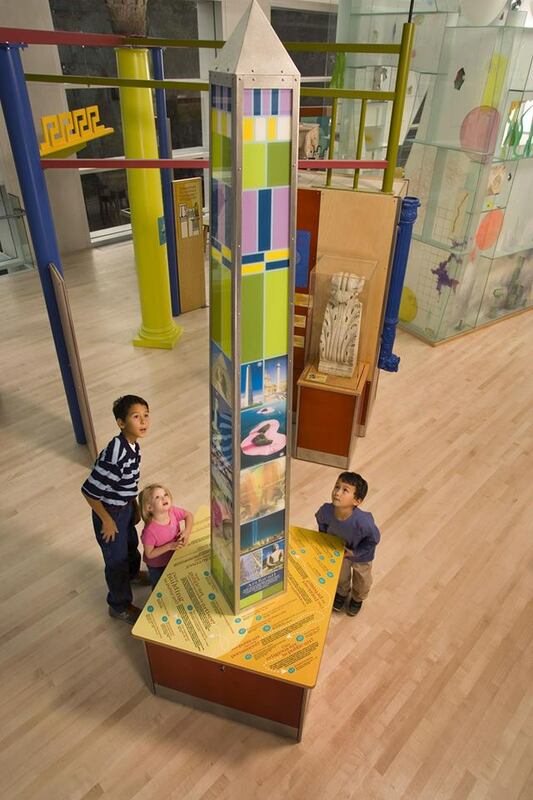 Children and families can try out pointillist painting techniques, make miniature Impressionist paintings, and go on a scavenger hunt of the exhibition. Local artists will be on hand to lead plein air painting demonstrations in front of the museum, and local musicians will provide a program of Impressionist music in the auditorium at 2PM. Investment is provided by the City of Savannah and the Georgia Power Foundation. 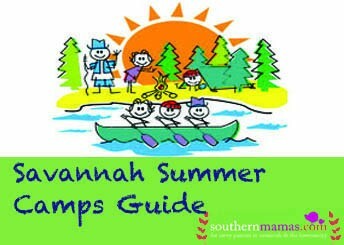 FIND MORE FREE FAMILY EVENTS IN SAVANNAH & HILTON HEAD IS. HERE. 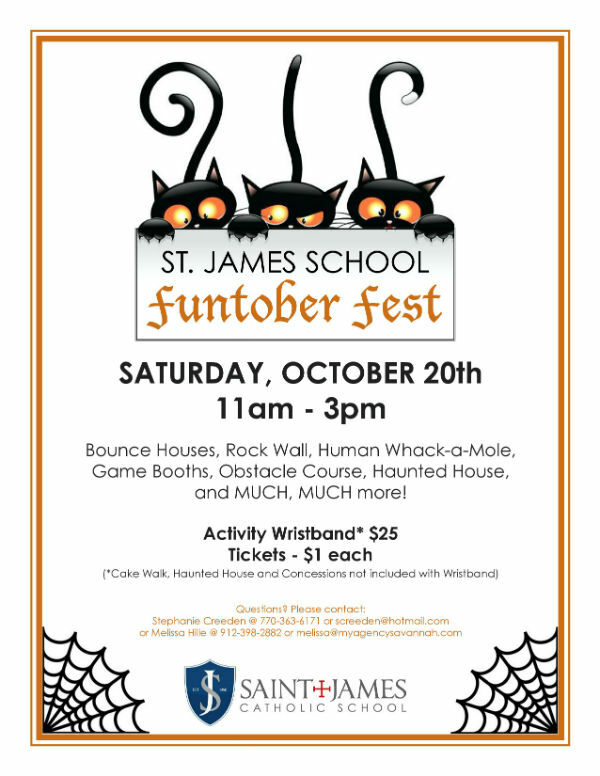 Bring your kids to St. James Catholic School Funtober Fest 2018, which is open to the public. 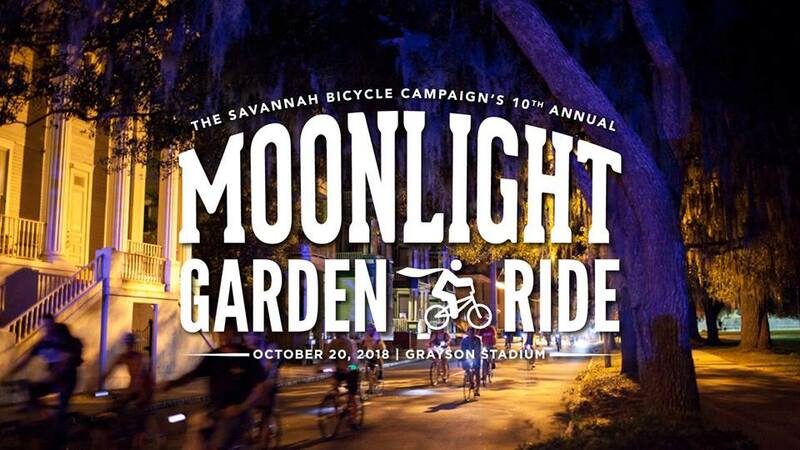 Did you know that Savannah’s favorite annual bicycling event is kid-friendly? In addition to the ride, Stroller Strong Moms will have some on-the-field fun at Grayson Stadium after the ride. There will also be balance bike races around the bases for the younger riders. Registration is open for SEGA SORBA’s Morning Marsh Madness 2018. Off-road race, fun race, family fun all for one low price. Do one or both. Two Family Friendly Events for the price of One! Come enjoy the Early Bird off-road race at 8:30AM Sat. Oct. 20 2018 and race one, two, or three laps depending on your skill level. 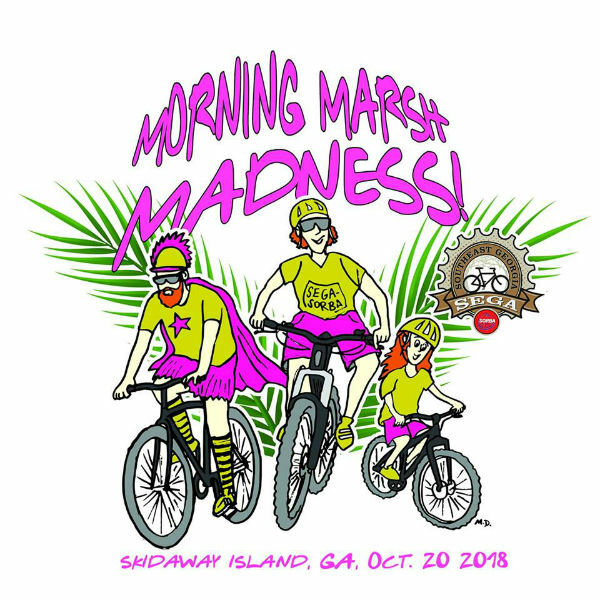 Then at 10:30AM enjoy wearing your pajamas or dressing up in your goofiest outfit and riding your beach cruiser, 90’s bike, or whatever contraption you can find, at the Sleepy Head fun race. Just a short race with the craziest most fun getup you can find. Meant to complement SBC’s Moonlight Garden Ride This is your opportunity to have off road fun in the morning before you head over to Moonlight Garden Ride in the evening. Choose to just race the Sleepy Head or the Early Bird, or both. One inexpensive registration for both events. T-Shirt Included. Register online here. FOR MORE FALL FESTIVALS 2018, VISIT THE SOUTHERNMAMAS.COM FALL FUN GUIDE 2018. 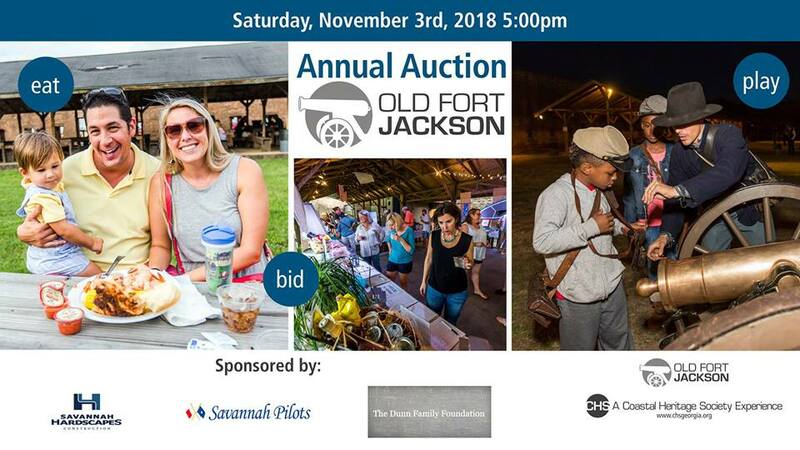 Save the date for Old Fort Jackson 37th Annual Silent Auction fund raiser Sat. Nov. 3 2018, 5-9PM. Guests can enjoy beautiful views of the Savannah River, a silent auction featuring many unique luxury items, observe artillery and musket demonstrations by costumed historical interpreters and eat delicious Lowcountry cuisine provided by Creative Catering. The money raised from this fundraiser will directly support Old Fort Jackson in Savannah and will help support daily educational programming as well as special events. The Annual Auction will have dozens of highly sought-after items for guests to bid on, including a 2-night stay at Tybee Beach Vacation Rentals valued at $600, an inflatable paddleboard from North Island Surf and Kayak valued at $625, 4 tickets to Atlanta Zoo valued a $104, a makers workshop for 6 to Salacia Salts valued at $240 and an Old Fort Jackson Soldier’s experience to learn how to fire the cannons valued at $750. Old Fort Jackson in Savannah is the oldest standing brick fort in the state of Georgia and one of only five remaining Second System coastal brick fortifications in the United States. The site is solely reliant upon admissions and donations from community supporters to continue operating as a public historic site. Admission to this event is free of charge. The Annual Auction is a family event and all ages are welcome. A Lowcountry boil and alcoholic and non-alcoholic beverages are available for purchase. This event is made possible by generous support from: Savannah Hardscapes, Dunn Foundation Inc, and Creative Catering. UPDATE: The winner is Robin Ritenour Jenkins ! Congratulations! Robin, please email us at anne@southernmamas.com. Tickets giveaway: We’re giving away four tickets to Poppell Farms pumpkin patch, corn maze. Enter to win: Just go to the SouthernMamas.com FB page & tell us your favorite Halloween costume- your own, your kids’, your hubby’s, your friend’s, anyone’s. This giveaway is faster than most. We’ll wrap it up by 10PM Wed. Oct. 11 & announce the winner soon after. 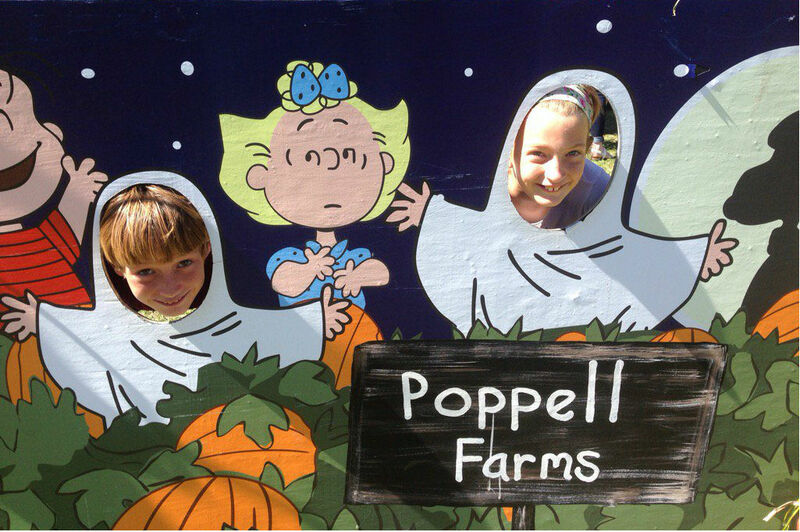 Be sure to visit Poppell Farms this month. The farm is open every October weekend. Corn maze, hayrides, farm fun. Feed animals in the petting farm, try steer roping, Spyder Slyder and the all-time kids’ favorite, crop hoppers for big kids, which are giant jumping air pillows that have kids giggling upon their first bounce. Learn more about Poppell Farms including hours & special events here.